For me, these fabric and styling posts might be the best part of designing a sewing pattern. As I’m developing each sewing pattern, I start collecting photos to inspire you when we release that pattern. And I’m always surprised at how many images I collect over the course of each season. I suppose it confirms that I’m “on trend,” although I really don’t like trends. I like styles that last. I totally agree with this perspective. I try to design styles that will last. There are so many trends I won’t touch: you just won’t see those styles from us because a year or two from now you won’t be interested in wearing them anymore. After all, what’s the point of sewing and wearing clothes that have a short lifespan? Instead, I try to play with proportions and with details because, like Jenna says, I want you to feel great in the clothes you sew from our patterns. And I want you to want to wear them when you’re done sewing them. Having said that, sometimes we all need a little inspiration. Whether you want a little guidance in planning your sewing projects and wardrobe or in getting dressed in the morning, I think it’s helpful to be inspired by photos. How are other people wearing similar styles? What are they wearing with those items, and does it give you ideas for combining your clothes from your own wardrobe in a new or different way? Is there someone whose style you admire from whom you can borrow some styling ideas? I keep a little stack of magazine tear sheets in my closet for those days when I just don’t know what to wear. If I’m feeling stuck or bored with my clothes, I flip through the tear sheets, find something that inspires me, and get dressed! Believe it or not, this saves me lots of time and keeps my perspective on my clothes feeling fresh. So consider these fabric and styling idea posts to be your little tear sheet collection for these styles. Your cheat sheet, perhaps. If you get stuck and don’t know what to wear when you’re getting dressed, look for ideas here! These digital tear sheets might also inspire your fabric choices. You could even print them out and keep a little tear sheet collection of your own in your closet. I’ve saved all of these images to the Liesl + Co. pattern styling ideas Pinterest board, so you can create your own Pinterest boards using them, too. So let’s look at the Maritime Knit Top first! Style icon Brigitte Bardot in one of her many striped shirts. 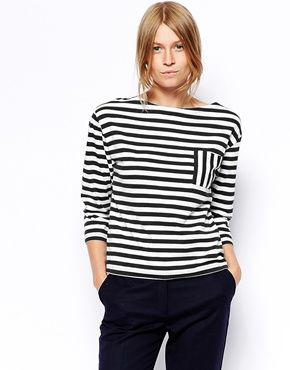 For a classic French look, pair the Maritime Top with basic black trousers (skinny, if you like, but wide legs would be cute too) and ballet flats. Jeanne Seberg and her Breton stripes. Audrey Tatou carries on the French style tradition. Wear the Maritime Top with a pencil skirt. I love the combination of stripes with floral. Add a zipper up the side seam. I really love the zippers I added to my Bento Tee. This yellow pencil skirt and a belt are such a great combination with the navy and white stripe. Wear it under a jacket with a statement necklace for a great look. Dress it up with great accessories like heels, a clutch, and a big belt. Here’s a similar top with fun and flirty floral skirt. It works, doesn’t it? Mixed patterns again. This one works because the print and the stripes share a color palette. Add a pretty bow and keyhole opening at the back. Shelley even wrote a bow keyhole tutorial for you! Wear it with a chambray Everyday Skirt for a classic look. Wear it with a maxi skirt this summer. Love the gold and white stripe. I’ll be watching for a Saint James fabric that matches! I think this woman is wearing shorts, but the curved hem reminds me of the City Stroll Wrap Skirt. With the Lisette moto jacket B6169 this would be such a cute outfit! With cut-offs or shorts for summer. This look is all about the cute accessories! I love the color-blocked stripes on this top. With all those Saint James stripes to choose from, you could easily make your own version similar to this! Try an embroidered neckline. In fact, you could widen the neck facing to give extra support to the embroidery if you need it. Here’s a embroidery tutorial to get you started, too! Layer the Maritime as part of your wardrobe. I love the layered sleeves here. Add a pocket. The change in direction of the stripes is a fun touch, isn’t it? This look is so cute and summery, worn with shorts and hat. And what a way to spend a summer, right? Don’t limit yourself to stripes, either. It’s just as cute in solid colors and other patterns. Later today I’ll post an Instagram photo of the short-sleeved woven version I’m wearing. I hope you’ll post your photos to our Liesl and Co. Flickr group or to Instagram using the #maritimetop tag. I think on the forums ‘What would Liesl do?’ is the go to sewing inspiration and advice thought (and mine!!). My dress choice go to thought is ‘What would Jenna wear?’ so I couldn’t agree with you more! Liesl, are there accessories that everyone must have in their wardrobe? Just thinking there must be basic pieces that make putting outfits together more interesting. Helena, thank you! I’m flattered. And Robin, I’m always hesitant to tell anyone there’s something they MUST have in their wardrobe. Everyone is different. But I’ll be happy to share what works for me, and maybe it will work for you, too? I’ll cover topics like this soon.